26 January 2016 is the 10th anniversary of the announcement of the Peninsula Dental School, now Plymouth University Peninsula School of Dentistry and then the first new dental school in the UK for 40 years. We won the bid to run the school based on the innovation of our approach to dental education – we were rewarded for daring to be new, for breaking new ground and for challenging some of the established ‘givens’ in the way in which we train our dental professionals. Ten years on and we have the reputation for introducing novel practices and creating qualified dentists who are uniquely suited to practise in an ever-changing NHS. While we continue to innovate, other dental schools are adopting our methods and the ‘Peninsula model’ is becoming embedded in standard dental education. Without doubt, those of us responsible for training the next generation of dental professionals have had to embrace new approaches, because the NHS requires that we find new ways delivering care. Foremost is the shift from viewing the treatment of oral disease as our primary function to one of its prevention and education. As a consequence, and as we have done at Peninsula from day one, dental education needs to move from the secondary care environment to primary care. We have achieved this by building a network of four Dental Education Facilities across the South West. 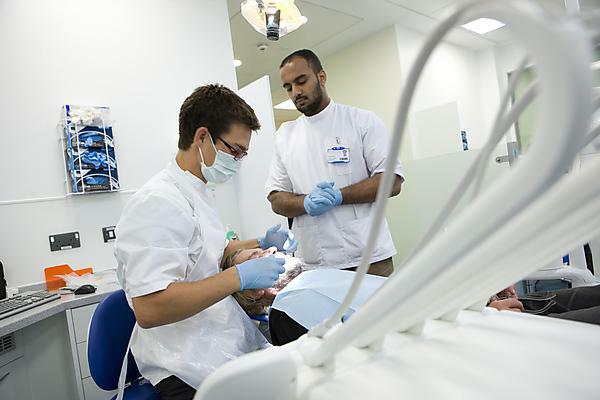 These are purpose-built multi-bay facilities where our dental students (dentists, dental nurses and hygienist/therapists) treat local NHS patients under the supervision of qualified dental professionals, as part of their studies. In this way, not only do we ensure that our students work with patients from a very early stage in their career with us (and leave us fully confident not only in their clinical skills but also in their ability to treat patients as a whole person and not just a mouth), but we also address local oral care needs. Since our first DEF opened in 2008 some 18,000 local people have received NHS dental care where they may have not done before. A significant proportion of those patients will be made up of people from groups for whom access to dental treatment may have been difficult, such as those with learning disabilities, substance addiction, the homeless, the elderly and the very young. With our state-of-the-art facilities we are committed to producing dental practitioners and dental therapists and hygienists with clinical skills of the highest order and a strong sense of social awareness. Welcome to Dentistry with the Faculty of Medicine and Dentistry. Key to our success is interactive communication with the communities in which our DEFs sit – and I believe that a closer relationship with local communities will be one significant and seismic requirement for the profession going forward. This extends too to the wider health provision community – from CCGs and local trusts, to local authorities who have taken on the mantle of public health delivery. We achieve this closeness via our award-winning Community Engagement Team, which not only builds positive relationships with a wide variety of groups with need within the community, but which also arranges and oversees our Inter Professional Engagement (IPE) programme. This embeds our students firmly in the community and sees them run projects with local community groups and their users. The projects are designed to address specific oral health requirements and over the years have resulted in changes to policy, approach and methods of care. This is why we are training dental professionals who will increase capacity in this environment - by tying them in to community engagement, we are also paving the way for dental professionals who can use the community around them to identify need, make early diagnoses and so have impact on oral disease prevention. Having in no small measure achieved this with our undergraduate students, we are developing a range of post-graduate and professional qualifications open to local primary care dentists. In order to target resources and be strategic about local investment, and the efficient and effective use of NHS resources, in 2013 we incorporated the DEF and community engagement programmes within the Peninsula Dental Social Enterprise. The social enterprise model is one which lends itself to dental primary care and one which we see as an important tool for dental professionals to use in the future. As well as the pressure for change coming from an ever-shifting NHS, both we as a profession and the NHS itself are having to adapt to the needs of changing patient demographic. The future is an ageing population who are living with their teeth for longer – the so-called “heavy metal” generation. These are people who have received complex dental work including dental implants. With age also comes an increase in the amounts and variety of prescribed medication (polypharmacy) which often results in oral side effects such as dry mouth. This in turn results in an inability to maintain oral hygiene with subsequent risk of dental disease. Add to this other conditions which come with age, such as dementia and reduced dexterity and mobility, and dental professionals now and in the future are presented with patients who present complex and in some cases new care challenges. This is what awaits the profession in the future, and this is why there is a constant need to innovate the way in which we train the dental professionals of tomorrow – a challenge which is bread and butter to the team here at Peninsula.